San Francisco, CA - 2011 Genitourinary Cancers Symposium - Howard I. Scher, MD discusses Abstract LBA#1 Effect of MDV3100, an androgen receptor signaling inhibitor (ARSI) on overall survival in patients with prostate cancer post docetaxel: Results from the phase III AFFIRM study at the 2011 Genitourinary Cancers Symposium (GU) meeting at the Marriott Marquis here today, Thursday February 2, 2012. 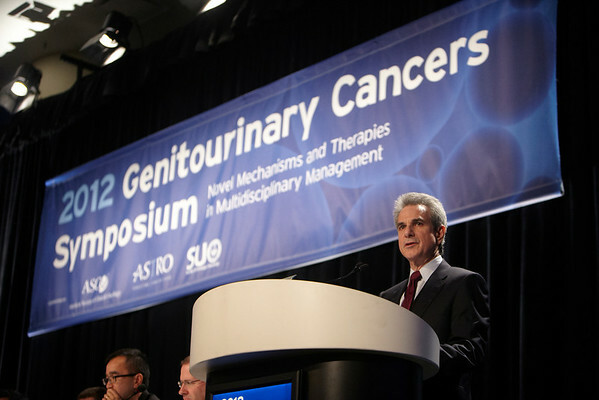 A record 2500 attendees from around the world were on hand to learn the latest treatment and research in Genitourinary cancers from fellow physicians, researchers, health care professionals, cancer survivors and patient advocates. Photo by © ASCO/Todd Buchanan 2012 Technical Questions: todd@toddbuchanan.com; Phone: 612-226-5154.